This is my statement I made in my opening remarks after I scrambled the phrase, "Division Mancom" while I was waiting for my turn to talk. "I command vision" prompted me to present it to my fellow school administrators. I referred it to the Lord's concern that He commanded us to look after His spirit children (the pupils) who are on our shoulders as school heads or principals. We are the Lord's stewards for them. Therefore, He has given us to be visionary, to look ahead for the bright future of these children who are under our care and custody when they are inside our school. It is our utmost concern for their welfare and for their well-being as a good, law-abiding citizens of the community where they live in and be obedient to God's commandments. 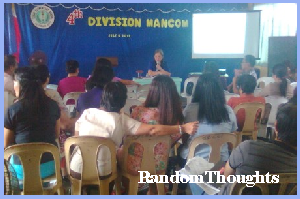 Division Mancom is a monthly meeting of all Department of Education (DepEd) school administrators in the La Carlota Division. The 4th Division Mancom was held in our school, Cubay Elementary School, this morning. It was well attended by the school principals of 24 elementary schools, 4 high schools, and 3 district supervisors and division education program supervisors. Attending also were department heads of the secondary and division head. La Carlota Assistant Schools Division Superintendent, officer-in-charged Portia M. Mallorca presided over the whole session of this meeting. Matters discussed were supervisory, administrative, and DepEd updates. She disclosed that she gets sick when she's unable to visit the school. She believed that everyday there's always a teacher in the classroom, who teaches a child. 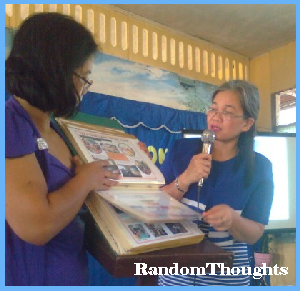 This blogger is the school principal of Cubay Elementary School which was the host of this MANCOM and served as an ideal venue for this educative gathering. 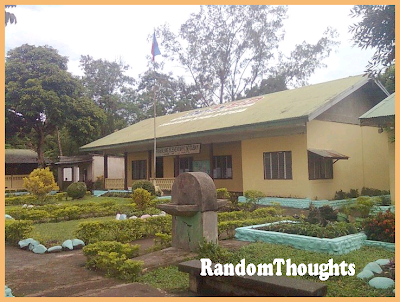 The physical facilities and the school plant were timely to have her facelift since the conduct of the annual national maintenance week, popularly known as Brigada Eskwela before the opening classes in June, and they're periodically maintained. The all-out support of Brgy. 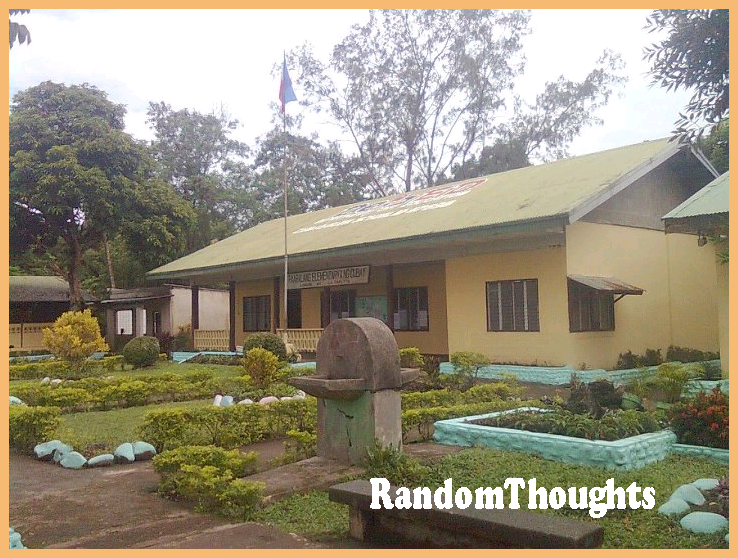 Captain Noel Vargas and the barangay council, and the community and Mrs. Racquel Angelitud, President of the Parents-Teachers Association (PTA) uplifted the prestige and dignity of the school as to her physical appearance. They also provided some foods for the visitors who attended the meeting. In the meeting proceedings, Mallorca tackled the issues and concerns on: the final enrollment of every school for validation before the end of July, the comparative results of National Achievement Tests from school year 2010-2011 and 2011-2012 with a minimal increase of 0.7 percent increase. She emphasized the proper documentation in preparing the report of Brigada Eskwela especially to the schools of La Carlota Sugar Central Elementary School and San Miguel National High school which are the Division entries in the search for BE best implementors. She mentioned the quarterly conduct of Earthquake and Fire Drill for the safety and disaster preparedness among the schools. While the other administrative matters were as follows: the 34th National Disability Prevention and Rehabilitation (NDPR) Week on July 17 - 23, 2012, Buwan ng Wika Pambansa, Agosto 1 - 31, 2012 with paksa: "Tatag ng Wikang Filipino, Lakas ng Pagka-Pilipino"; 2012 White Cane Safety Day, August 1, 2012 with the theme: "Making the Rights Real Right Now for the Visually Impaired"; 2012 National Teachers' Month Ceelbration on Sept. 5 to Oct. 5 with the theme: "My Teacher, My Hero"; Ms. Ruth F. Villanueva, Administrative Officer V advised the secondary school heads to be wary about their internet usage, and among others. In the afternoon, the education program supervisors (EPS) presented their supervisory concerns like EPS Marcelita Triño on blood letting and nutri-quizzes, EPS Mithos Hiponia on division cultural contest and the conduct of classes in MSEP for Grade 1, EPs Leilanie Castillo on Filipino on the celebration of Buwan ng Wika and Grade 1 budget outlay, and EPS Zenaida Gahaton on the increase of Science NAT results for the first time in several years and activity in September. Other EPS like Gloria Tionsay showed her concern on essay writing contest for elementary and high school with the theme, "Risks Disaster Preparedness", and the conduced of Division Unified Tests (DUT) sometime in the first week of August 2012, Mr. Alejandro Ticao, Boy Scout coordinator on scouting, and Dr. Ivan Corgos, Division Dentist on pupils' deworming on July 27. The educators in this one-day management meeting before they adjourn unanimously agreed that La Granja National High School would be the next host for the 5th MANCOM in August 2012. Then a tree planting in the selected ground in the campus ensued. 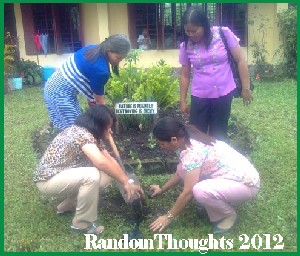 ASDS-OIC Mallorca with some school heads planted a tree, including this blogger too. What she did is a "good turn". By planting a tree is saving another life. With this step, sir. You're not only a teacher for students, but a teacher for all! Keep it up! Great activities lined up. We usually do tree planting when I was still studying. I like essay writing contest as I've won a few contest including one in the national level in college. Truly a remarkable project lined up here. Planting trees can be one of the best green things you can do for the environment. I hope others will also join you and do the same activities you guys started. The children are our future, and they can only be strong pillars of the future if the stewards of today teach them well. Your students are privileged to have you, sir Gil! In deed a wonderful project! I hope this would apply to most school in the Philippines to support and mold student towards their quest of knowledge and education. Kudos sir, most especially sa tree planting activity! You are doing a great job over there Sir Gil. Mancom is indeed a tool to review as well as renew things. Great job Sir! This is a great project. I salute teachers like you. I Never have any Idea of what teachers doing besides teaching. Nice you share it. Now I know. Saludo ako!!! This is an awesome activity. The students will learn to protect the environment and so they will know that teachers are also concerned about nature. Education indeed covers several aspects and this just shows that academics is just one of the many concerns of a teacher. the students but the teachers as well. suddenly I remembered the word MANCOM. My boss usually get stressed when our bank's MANCOM meeting is coming up. more paper works and presentation for her.